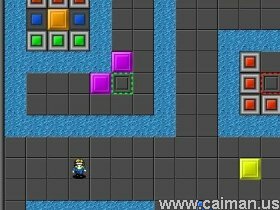 Caiman free games: Challengo by Xanthom. 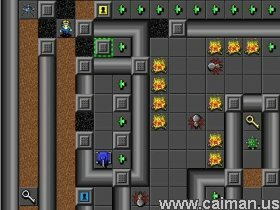 An Excellent all round Puzzle game. This game was inspired by an older game called Chip's Challenge. The original version of Chip's Challenge was created by Chuck Sommerville in 1989 for the Atari Lynz. I highy enjoyed the game (the Windows Enteraiment Pack Version was the one i played. I was disappointed that an announced sequel would remain unreleased. Eventually the desirefor a new game with similar gameplay led me to create this game. This game is not exactly the same, of course, as there are many new elements to the gameplay, and some old gameplay elements have been modified. Ray was living a normal life, until he woke up one night and found himself in a dark, cold world. This world was filled with many traps, puzzles and monsters. He could hear the chuckles of an angry demon in the distance challenging him. Where was he ... and why did he appear here in the first place ? Was he just having another one of his crazy nightmares ? Ray wasted no time and fought his way through this world trying to get to the bottom of this mystery. Challengo is a superb puzzle game with good graphics and sound and gameplay that does become very challenging as you work your way through the levels. Start of on the first 10 Lesson levels to get an idea on how this game works, it has loads to offer and will prepare you for later levels. Before playing this game press F1 and have a read to understand this game more. The idea of the game is to get Ray to Goal what is known as the portal. There are many obstacles you will have to overcome on your way to the portal, some are monsters but most are puzzles or traps. You need to collect the point shards ( Plus Symbols) to open the portal to exit it, each shard is worth some points and depending on the color of how higher value they are worth. There are so many different things you will encounter while playing this game like Invisible walls, pits, dynamite, tanks, warps, blocks of all kind and some special footware to help you get across certain surfaces, these are just a handful of what is in this game. The game has loads to offer and with 80 levels it will keep any puzzle head busy for a while. "A must for a download "